Samsung is known as one of the biggest and most famous electronics manufacturers in the world, but it is also an adjective used in music to describe a piece in which the vocals are performed by a singer, typically tenor or bass, by the name of Sam.1 The name of the brand is Korean, of course, and apparently means three stars, which must be rather awkward in the age of Amazon when everything is rated on a five star scale rather than the Michelin-style three, for now it suggests mediocrity, a vague competence maybe, but no more. However, in view of the usual fare on this blog, simple competence would already be quite welcome. Can they actually reach that lofty height? Let’s see! 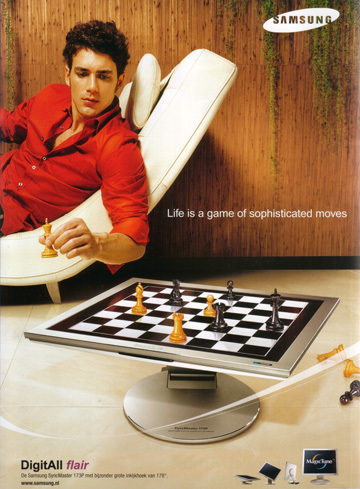 “Life is a game of sophisticated moves”, claims the caption. No doubt, the sophisticated move in question is turning the monitor upwards so it can function as a chess board and it must be admitted that, if this is a touchscreen and some engine is reading the moves, this is rather clever. Still, I feel it would be even cleverer to turn one’s chair2 towards the board when one plays. I could understand not wanting to see the sort of positions we usually deal with on this blog, but this one is honestly not so bad. Readers with the eyes of an eagle4 will have spotted that the white king is missing. The reason for that is that the guy who’s presumably playing has it in his hand. I want you stop and think for a moment about how weird that is. 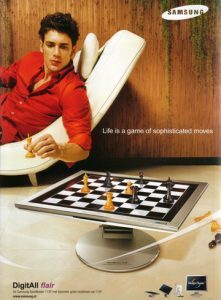 You normally first think about which move you’ll make and only after that do you take the piece in hand and quickly make the move. The only exception is when it is absolutely clear which piece has to move. 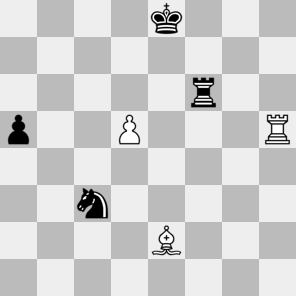 Probably, white was put in check, leaving a priori 21 possible squares for his king. Some of those can immediately be ruled out – were the king on b4, for example, white would take the knight – but for others it’s not so cut and dried. It seems reasonable to assume that had black been able to simply take the bishop he would have done so. This pretty much rules out the 6th rank as well as f4. My intuition tells me the king was on f3, but my intuition has been known to have a vivid imagination. Realism: 4/5 I do not dare to give perfect marks as I’m not sure the white king is not on some ridiculous square like a8 or something, but barring that the position seems perfectly normal. Probable winner: Nobody, a draw seems very likely after Nxe2 Re5+ and Rxe2.